Attorney General Pam Bondi stopped in Ocala on Tuesday to sign an emergency order that would make U-47700 illegal statewide. The order, which was expected to take effect after 5 p.m. Tuesday, was Bondi’s 137th emergency order banning some form of synthetic drugs throughout Florida since she assumed office nearly six years ago. U-47700, which officials at a news conference held at the Marion County Sheriff’s Office’s Multi-Purpose Building on the agency’s compound, is deadly, and is already illegal in Georgia, Ohio, Virginia and Wyoming. The federal government has a temporary ban on the opioid, officials said. If caught with the drug that authorities said is 7.5 times stronger than morphine, it’s a third degree felony and punishable of up to five years in prison if convicted. Marion Sheriff Emery Gainey said Bondi has worked tirelessly in fighting to outlaw synthetic drugs in Florida and has dismantled pill mills. Before becoming sheriff in May, Gainey was a member of Bondi’s senior executive staff in the director of law enforcement and victim’s services office. Bondi, introduced by Gainey, told reporters that U-47700 comes in a powder form that can easily be mixed with other potent drugs. She said it could also take the form of a pill — i.e. Xanax — so when people think they’re purchasing Xanax, it maybe be Xanax mixed with U-47700. She said it began in Asia and was smuggled into the United States through Canada and Mexico. 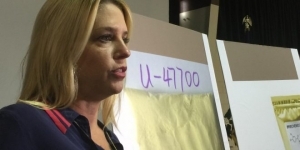 Bondi reported Pinellas County officials said five deaths have been attributed to U-47700 — or pinky — as it was present with other drugs during testing. In Bay County, Bondi said there were three deaths where U-47700 was mixed with other drugs. While Gainey said in Marion County they don’t know of anyone dying from U-47700, Bondi said it was not on their radar until recently. She said now that they know what they’re looking for, medical examiner’s offices will have a better way of analyzing it. “It’s a lethal cocktail,” Bondi said. At Tuesday’s news conference, Bondi said she hopes to “try and stop it before someone dies.” She urges parents and guardians to check what they children are buying online as the drug is a popular commodity. In other surrounding counties such as Levy County, Sheriff Bobby McCullum, who attended the news conference, told the Star-Banner that it’s new to them and they’re not aware of any deaths linked to U-47700 in their area. Bondi said one of the problems they face is everything an emergency order is signed, then, the chemist changes the compound. Now, she said, they’ve added several categories of drugs so they can still go after those making, manufacturing and producing synthetic drugs.